I've mentioned on and off about spending my childhood in a country different from my own. It is kind of ironic that I am now raising Little Dude away from home too! 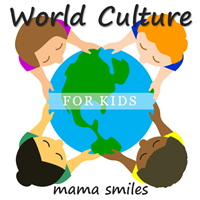 And I have written all about these experiences in my guest post over at Mama Smiles blog in her wonderful 'World Culture for Kids' series. Head on there to read about the pros and cons of raising your children in another country, in a culture very different from your own. In fact, this is my second guest post for this blog. The first one was about introducing Dubai to children and families around the world. Thank you so much for this insightful post!!! What's your family's digital footprint?